These edifices are dedicated to spiritual practices, studies ,worship and serve as moral and cultural hub for the Khmer People. I‘ve realized a series of recordings inside and around the enclosure of Pagodas in various provinces separate geographically. During an unique passage, I spent a brief time to capture the singularity and atmosphere of each site that I’ve visited. Depending on the topology and acoustic properties of each place, I’ve collected raw elements and hidden sonic matter with variable approaches and techniques. I found it important to integrate in my recordings on location the outskirts of each area, and the interconnection with the local environment. I was interested to have a wide angle of representation of the surroundings. Also, I’ve tried as much as I could to minimize my interaction inside the location with the daily activities, the studies, practices or ceremonies. 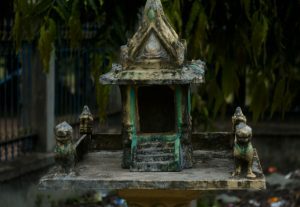 The sonic fragments captured in the zone of Pagodas, and the converging points from one place has been merged together. All these elements constitute the substrate of each movement inside my piece. My process in my composition has been to interleave the different regions and localities distant spatially. A recombination of disparate moments in a new continuum form as a figment of altered realities, pushing the boundaries of each location, linking the interstices into a ‘sfumato’ of a different perception and remembrance.